It was a long journey to Newcastle. A very long journey. But on the CCR fun bus spirits we kept our sprits high for what was going to be an epic battle of a game. We arrived to find an odd looking building concealing a very nice dome shaped sports hall and at 3 o’clock both teams were ready for action. NRG’s jammer was first to break the pack and take the first points of the game but CCR came back strong taking the second jam. NRG’s strong walls enabled their nippy jammers to rack up the points for a while but a series of CCR power jams allowed the Slays to stay in the game. At half time the scores stood at NRG 132 – CCR 55. One tuna sarnie later and CCR started the second half with another power jam which, after picking up some points, was called off to prevent NRG scoring. Toe stop drama occurred when CCR’s jammer lost one on the jam line and had to step aside for essential skate maintenance, NRG seized this opportunity to get some more points on the board. 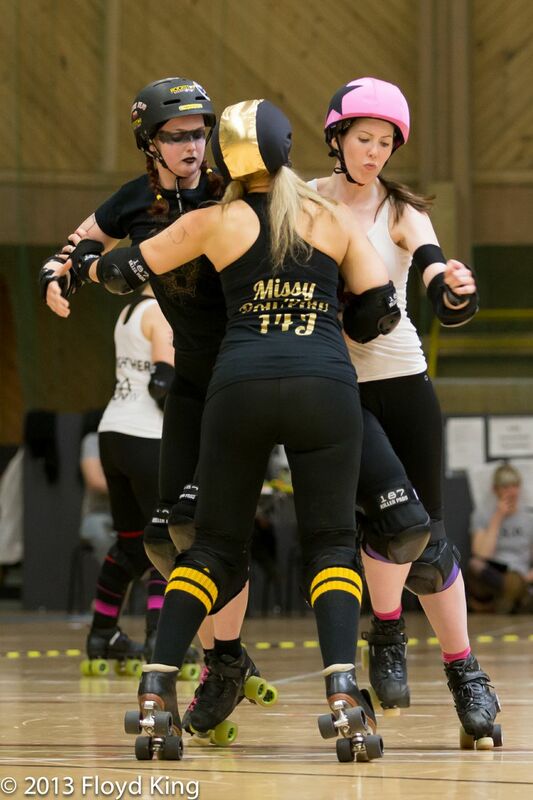 The second half also saw some awesome jammer on jammer action which showcased the determination of both teams. Despite CCR digging in their heels to give them a real fight NRG continued to play extremely well. 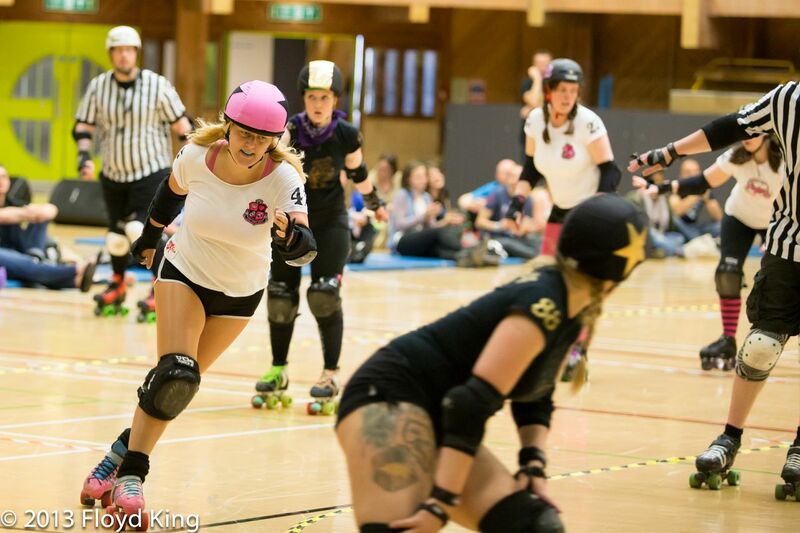 The game had seen both teams work their stripy socks off and the final whistle went at NRG 259 – 122 CCR. But the day was not over! Always looking on the bright side, we paid a visit to the Angel of the North (culture vultures), before jumping back in the fun bus and slapping in the Ultimate Office Party CD (like I said, culture vultures) and away we went on our long, long journey home. CCR ROSTER: 1212 Lola Whip (Captain),14 Blocker Bye Baby, 1832 EmRaa, 22 Em on Bread, 286 Charlie Scraplin, 29 Gerty GoGo, 43 Beth Metal, 44 Nok-turnal, 5000 Boots Manuva, 505 Naughtigal Nelly, 61 Erin Blockhervich, 80 Skar Siren 99 Weston Super Clare, M30W Kat Fighter. Line Up Manager: Faze’her. Bench Manager: Tinchy Slider. Every fancied trying Derby? CCR are hosting a free to attend ‘Get Your Skates On’ event and invite all over 18s to come and have a taste of quaddy goodness this Saturday! (6th July 2013, 12 – 2pm) You can find more information about the event held at Doug Ellis Sports Centre, Perry Barr by joining the facebook event here. Or email new skate coach Twister Mister to reserve hire kit at twistedmister976@googlemail.com. See you there!